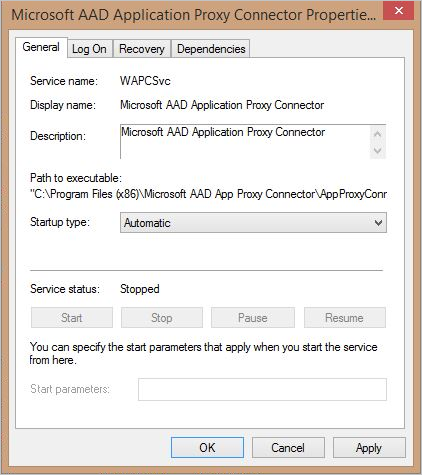 Open Event Viewer and look for Application Proxy connector events in Applications and Services Logs > Microsoft > AadApplicationProxy > Connector > Admin. If needed, more detailed logs are available by turning on the Application Proxy connector session logs. For more information about the Azure AD Troubleshooting tool, see Troubleshooting tool to validate connector networking prerequisites. You may have problems with your application rendering or functioning incorrectly without receiving specific error messages. This can occur if you published the article path, but the application requires content that exists outside that path. For example, if you publish the path https://yourapp/app but the application calls images in https://yourapp/media, they won't be rendered. Make sure that you publish the application using the highest level path you need to include all relevant content. In this example, it would be http://yourapp/. If you change your path to include referenced content, but still need users to land on a deeper link in the path, see the blog post Setting the right link for Application Proxy applications in the Azure AD access panel and Office 365 app launcher. Connector registration failed: Make sure you enabled Application Proxy in the Azure Management Portal and that you entered your Active Directory user name and password correctly. Error: 'One or more errors occurred.' If you closed the registration window without signing in to Azure AD, run the Connector wizard again and register the Connector. If the registration window opens and then immediately closes without allowing you to log in, you will probably get this error. This error occurs when there is a networking error on your system. Make sure that it is possible to connect from a browser to a public website and that the ports are open as specified in Application Proxy prerequisites. Clear error is presented in the registration window. Cannot proceed If you see this error and then the window closes, you entered the wrong username or password. Try again. Connector registration failed: Make sure you enabled Application Proxy in the Azure Management Portal and that you entered your Active Directory user name and password correctly. Error: 'AADSTS50059: No tenant-identifying information found in either the request or implied by any provided credentials and search by service principal URI has failed. You are trying to sign in using a Microsoft Account and not a domain that is part of the organization ID of the directory you are trying to access. Make sure that the admin is part of the same domain name as the tenant domain, for example, if the Azure AD domain is contoso.com, the admin should be admin@contoso.com. Failed to retrieve the current execution policy for running PowerShell scripts. If the Connector installation fails, check to make sure that PowerShell execution policy is not disabled. 1. Open the Group Policy Editor. 2. Go to Computer Configuration > Administrative Templates > Windows Components > Windows PowerShell and double-click Turn on Script Execution. 3. The execution policy can be set to either Not Configured or Enabled. If set to Enabled, make sure that under Options, the Execution Policy is set to either Allow local scripts and remote signed scripts or to Allow all scripts. Connector failed to download the configuration. The Connector’s client certificate, which is used for authentication, expired. This may also occur if you have the Connector installed behind a proxy. In this case, the Connector cannot access the Internet and will not be able to provide applications to remote users. Renew trust manually using the Register-AppProxyConnector cmdlet in Windows PowerShell. If your Connector is behind a proxy, it is necessary to grant Internet access to the Connector accounts “network services” and “local system.” This can be accomplished either by granting them access to the Proxy or by setting them to bypass the proxy. Connector registration failed: Make sure you are an Application Administrator of your Active Directory to register the Connector. Error: 'The registration request was denied.' The alias you're trying to log in with isn't an admin on this domain. Your Connector is always installed for the directory that owns the user’s domain. Make sure that the admin account you are trying to sign in with has atleast application administrator permissions to the Azure AD tenant. This table covers the more common errors that come from Kerberos setup and configuration, and includes suggestions for resolution. 12008 - Azure AD exceeded the maximum number of permitted Kerberos authentication attempts to the backend server. This error may indicate incorrect configuration between Azure AD and the backend application server, or a problem in time and date configuration on both machines. The backend server declined the Kerberos ticket created by Azure AD. Verify that Azure AD and the backend application server are configured correctly. Make sure that the time and date configuration on the Azure AD and the backend application server are synchronized. 13016 - Azure AD cannot retrieve a Kerberos ticket on behalf of the user because there is no UPN in the edge token or in the access cookie. There is a problem with the STS configuration. Fix the UPN claim configuration in the STS. 13019 - Azure AD cannot retrieve a Kerberos ticket on behalf of the user because of the following general API error. This event may indicate incorrect configuration between Azure AD and the domain controller server, or a problem in time and date configuration on both machines. The domain controller declined the Kerberos ticket created by Azure AD. Verify that Azure AD and the backend application server are configured correctly, especially the SPN configuration. Make sure the Azure AD is domain joined to the same domain as the domain controller to ensure that the domain controller establishes trust with Azure AD. Make sure that the time and date configuration on the Azure AD and the domain controller are synchronized. 13020 - Azure AD cannot retrieve a Kerberos ticket on behalf of the user because the backend server SPN is not defined. This event may indicate incorrect configuration between Azure AD and the domain controller server, or a problem in time and date configuration on both machines. The domain controller declined the Kerberos ticket created by Azure AD. Verify that Azure AD and the backend application server are configured correctly, especially the SPN configuration. Make sure the Azure AD is domain joined to the same domain as the domain controller to ensure that the domain controller establishes trust with Azure AD. Make sure that the time and date configuration on the Azure AD and the domain controller are synchronized. 13022 - Azure AD cannot authenticate the user because the backend server responds to Kerberos authentication attempts with an HTTP 401 error. This event may indicate incorrect configuration between Azure AD and the backend application server, or a problem in time and date configuration on both machines. The backend server declined the Kerberos ticket created by Azure AD. Verify that Azure AD and the backend application server are configured correctly. Make sure that the time and date configuration on the Azure AD and the backend application server are synchronized. For more information, see Troubleshoot Kerberos Constrained Delegation Configurations for Application Proxy. This list covers errors that your end users might encounter when they try to access the app and fail. The website cannot display the page. Your user may get this error when trying to access the app you published if the application is an IWA application. The defined SPN for this application may be incorrect. For IWA apps, make sure that the SPN configured for this application is correct. The defined SPN for this application is incorrect. Make sure that the SPN configured for this application is correct. The user who tried to access the application is using a Microsoft account rather than the proper corporate account to sign in, or the user is a guest user. Make sure the user signs in using their corporate account that matches the domain of the published application. Microsoft Account users and guest cannot access IWA applications. The user who tried to access the application is not properly defined for this application on the on premises side. Make sure that this user has the proper permissions as defined for this backend application on the on premises machine. This corporate app can’t be accessed. You are not authorized to access this application. Authorization failed. Make sure to assign the user with access to this application. Your user may get this error when trying to access the app you published if they use Microsoft accounts instead of their corporate account to sign in. Guest users may also get this error. Microsoft Account users and guests cannot access IWA applications. Make sure the user signs in using their corporate account that matches the domain of the published application. You may not have assigned the user for this application. Go to the Application tab, and under Users and Groups, assign this user or user group to this application. This corporate app can’t be accessed right now. Please try again later…The connector timed out. Your user may get this error when trying to access the app you published if they are not properly defined for this application on the on-premises side. Make sure that your users have the proper permissions as defined for this backend application on the on premises machine. This corporate app can’t be accessed. You are not authorized to access this application. Authorization failed. Make sure that the user has a license for Azure Active Directory Premium or Basic. Your user may get this error when trying to access the app you published if they weren't explicitly assigned with a Premium/Basic license by the subscriber’s administrator. Go to the subscriber’s Active Directory Licenses tab and make sure that this user or user group is assigned a Premium or Basic license. If you encounter an error or problem with Azure AD Application Proxy that isn't listed in this troubleshooting guide, we'd like to hear about it. Send an email to our feedback team with the details of the error you encountered.